After months of ignoring a niggly pain on the outside of my knee, the time had come to finally do something about it. Armed with the latest advice from Google and a 4mm hex key, I set about adjusting my cleats and, just like the hokey-cokey, they were rotated in, out, in, out, shaken all about. Niggly turned to painful, painful turned to debilitating and that was it... my cycling came to an abrupt halt and I was off the bike for weeks... I needed a superhero. After much thought, I realised I had been misguidedly typing the wrong keywords into Google. A change of tactic found me typing... 'lateral knee pain, cycling, superhero' and up popped local business Proper Cycling & Coffee. "Umm... coffee," I thought to myself, adding "I'm not an expert, but I don't think coffee will resolve anything!" But then I noticed that they also provide a bike fitting service. 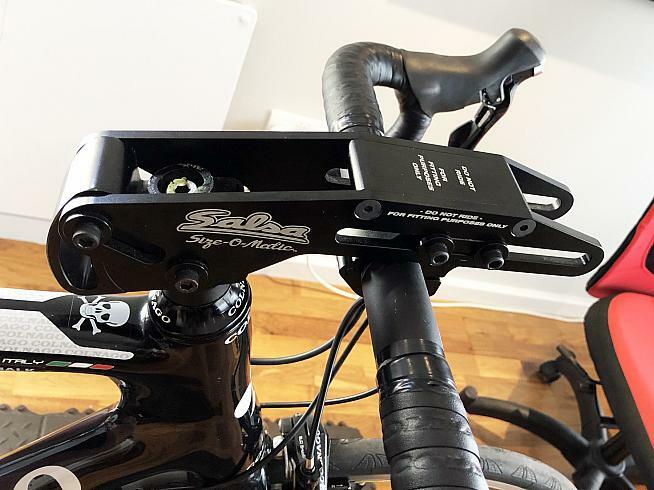 "Your position on your bike is vital for your comfort, injury prevention, efficiency and enjoyment," the website stated, and went on to mention, "even the smallest change in your bike set up can prevent injury and stop discomfort or pain experienced during riding." This sentiment resonated with me, over and over again. "I need this," I thought to myself... and before I knew it I had an appointment booked at their studio in Lewes, East Sussex. An adjustable stem helps dial in the optimum handlebar position. Proper Cycling & Coffee, an independent brand based in Sussex, have brought together a team of cyclists, mechanics, bike fitters and baristas all under one roof. They're also branching out into the cycling holiday business. I turned up at their premises armed with my Colnago and a bag full of misaligned shoes... not a hex key in sight. I was greeted by Ross, Proper's bike fitting virtuoso, who, after our initial introductions, set about describing his bike fitting ethos to me. "It's all about the rider, and every rider is different," he explained. This approach is in contrast to my previous bike fit some four years ago, which involved jigs, stickers and a stick-man image of myself projected onto a computer screen. No such newfangled computer graphics for Ross, though; once he had my cleats set up, he'd have me on my own bike and use his superpowers (experience, hearing and vision) to perfect my position. Ross, being methodical, has four distinct phases that he meticulously follows in order to achieve optimum results. First up is the cleat setup. Ross has experimented with an elaborate array of measuring devices, lasers and other contraptions, but nowadays his weapons of choice are a trusty marker pen and a reel of masking tape. He got me standing in my shoes while he located my first and fifth metatarsal knuckles respectively (i.e. the lumpy bit to the outside of my big and little toes), before applying strips of masking tape followed by a marker pen dot to indicate the tip of my lumpy bits. 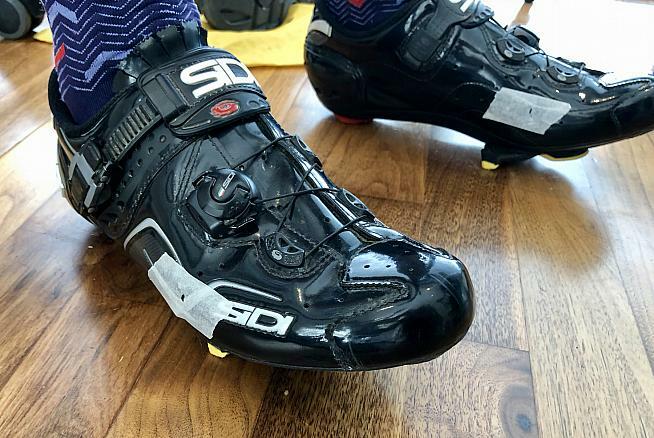 "Riders generally place their cleats in the centre of the ball of the foot, but I find this position too far forward causing heel drop and less stability. I prefer to bring the cleat back towards the fifth metatarsal," Ross explained. "How far back depends on analysis of the pedal stroke. I always look to provide stability in the foot and a good solid base for power transfer through the pedals," he added. Once my cleats were suitably aligned to their new position, Ross had me on my bike which was by now mounted on a turbo trainer. It felt good to be riding again and my left knee was more content than it had been in months. Ross observed that both knees, but mainly my left, kick out at the top of each stroke. His methodology would cure this. Proper bike fit expert Ross runs the rule over Dave's Colnago setup. 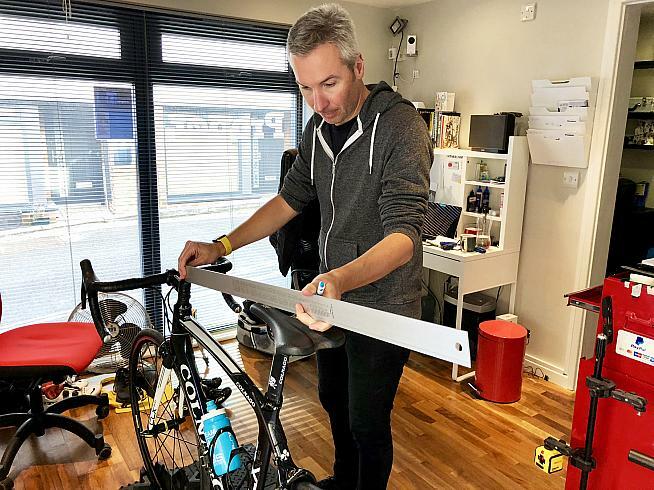 At this stage many bike fitters would use angle measurements or video analysis to achieve the perceived optimal saddle height, but Ross has no need for such technological gizmos as he just engages his audio and visual senses, which achieve far more accurate results. "It's specific to the individual rider and gets maximum power out of the legs whilst preventing injury," he explains. The process involves putting me into under extension by lowering my saddle, where it is clear that my pedal stroke has developed a discrepancy in the smoothness department. This is followed by incremental increases in height, where Ross observes my gyrating limbs and listens keenly to the sound of the turbo trainer. The smoothness improves with every incremental change, and just when I think I've reached pedalling nirvana, my saddle is popped up yet again and my stroke is even smoother. This continues until Ross observes that I'm now over extending as the smoothness begins to dissipate, indicating that I have now reached my limit; he promptly drops me back down to my perfect position. My saddle has been moved up an astonishing two centimetres. It feels good, and I'm starting to dream about the additional power this position will generate; but Ross hasn't finished, he's ready to move on to stage three. Ross watches me on the turbo to assess my pedalling style and determine the best fit. Ross explains that this is the most important part of the bike fit, and one that is often overlooked. "This is all about the position of the sit bones over the bottom bracket," he explains, adding "by getting the fore and aft position right we can remove pressure on the hands, achieve a perfectly smooth pedal stroke, get the rider balanced and get all the muscles in the legs working together." During each increment he encourages me to put the hammer down and provide feedback as to where I can feel the muscle burn. At first, I feel it in lower quads, but as we progress towards my optimum position the workload is starting to spread across all the quad muscles with my hamstrings also being engaged. The result is that my saddle has been moved forward five millimetres. It feels wonderful: the combination of an increased saddle height and reduced setback has left me experiencing more smoothness than one of Proper's skinny lattes and more power than one of their double espressos. The fourth and final stage is to see how my body reacts to different handlebar positions. This is achieved by fitting an adjustable stem. Ross explains that the biggest problem he usually encounters here is riders with back issues who raise the front end of their bike for a more upright position. "They look stunned when I lower the bars, relieving the pressure from their back and shoulders," said Ross, adding "it's the opposite solution to what most people think, but it works!" Cleat position can make a massive difference to comfort on the bike... but there's only so much you can do with a hex key. A few positions are tried, but we settle on dropping the bars about halfway down the steerer tube, and my own stem is reinstalled with the spacers manoeuvred to accommodate the bars' new location. My new position is complete! My knees no longer kick out, I'm smooth, I'm powerful and I'm aero... it's time to let me loose on those Strava segments! Ross has provided me with an impressive service today, together with an insight into the crucial role of the bike fit. 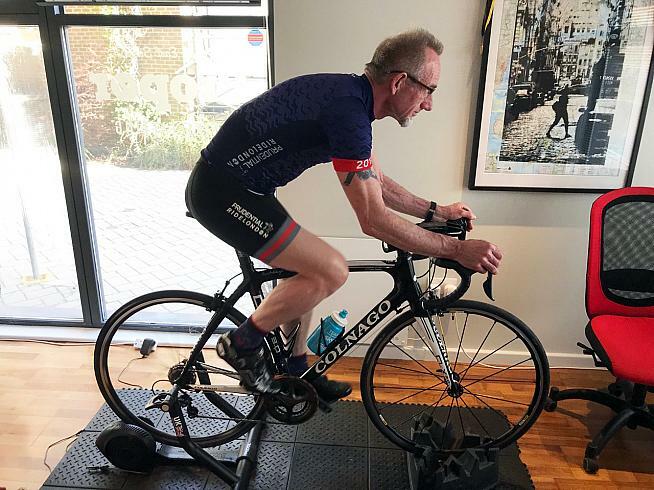 He sums it all up by stating: "Our bodies change as our fitness, flexibility and age changes... A bike fit is the best accessory you can buy for your bike!" He likens not having a bike fit to buying an expensive suit but informing the tailor that if the arms or legs need taking in, you'll do it yourself. So, if you want to attain the full potential of your expensive machine, then Ross is your man. The price for a full Proper bike fit is £150, which includes a one hour follow-up session within six weeks. For under 18s the cost is £100 for the initial session and £50 thereafter for each regular follow up. Proper also supply a foot correction service for £145 and a second bike geometry session for £85. If you want to be comfortable on your bike, improve your speed and sustainability, and remain injury free then £150 is a small price to pay for such an essential service. Thanks to Ross and Proper Cycling & Coffee for their expert assistance. For more details visit www.propercycling.co.uk.